The existence of a beauty premium in the labor market and the male/female wage gap suggests that appearance can matter in the real world. 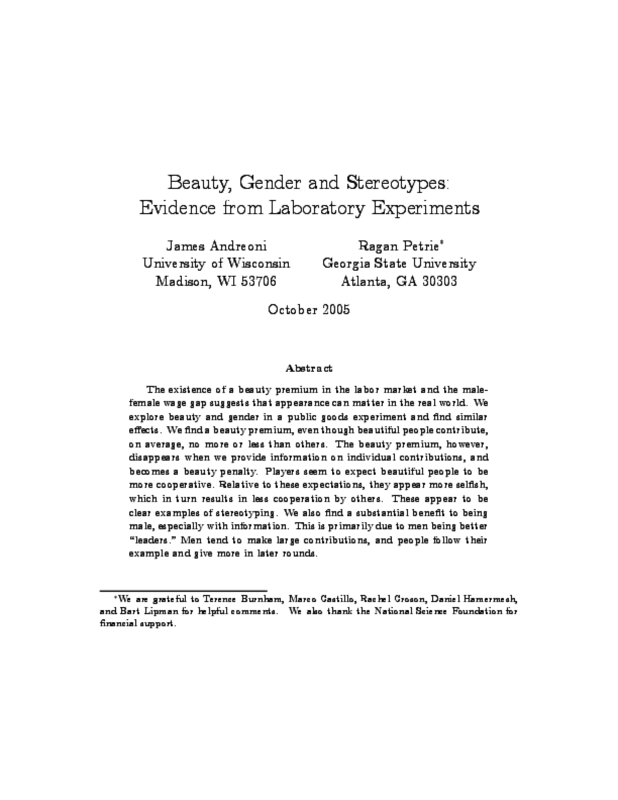 We explore beauty and gender in a public goods experiment and find similar effects. We find a beauty premium, even though beautiful people contribute, on average, no more or less than others. The beauty premium, however, disappears when we provide information on individual contributions, and becomes a beauty penalty. Players seem to expect beautiful people to be more cooperative. Relative to these expectations, they appear more selfish, which in turn results in less cooperation by others. These appear to be clear examples of stereotyping. We also find a substantial benefit to being male, especially with information. This is primarily due to men being better "leaders." Men tend to make large contributions, and people follow their example and give more in later rounds.